It is a non-invasive/non-surgical procedure with the same or comparable results as traditional surgery. Before the treatment the topical anaesthetic is applied, ensuring a painless procedure. This innovative technique can­not cause the so-called “overlifting”, as it only damages excess/loose skin which returns to its “original state” after the regeneration phase. A par­tial effect can be seen immediately after the treatment. You need to wait for 2–4 weeks to see the perfect results. The procedure can be carried out only by a certified specialist. The Plasma treatment uses the fourth state of matter – plasma. Tissues treated “sublimate” and we avoid spreading unwanted heat to the sur­rounding areas. The principle is to ionize gases in the air to create a small electrical arch, similar to a tiny lightning bolt, with which dermal and epidermal areas, which are affected by aesthetic problems, may be treated without spreading unwanted heat to the surrounding areas. When the electrical arch – plasma – touches the skin surface, the heat wid­ens the acne and is transferred into the epidermis all the way to the pap­illary layer which contains fibroblast cells. The result is contraction and tightening of the skin cells. Consequently, the excess skin is reduced and the result is comparable to lifting or wrinkle reduction. First, the topical anaesthetic (cream) is applied, minimizing the risk of pain and numbing the treated area. The anaesthetic takes effect 40 min­utes after the application. The procedure itself does not last long, 20–30 minutes depending on the area. The duration of the treatment (with anaes­thetic application): 60–90 minutes. Is any special pre-treatment required? There is no special pre-treatment needed. It is advisable that you do not apply any cosmetic products on the treated area (especially those contain­ing alcohol). During the consultation you should mention all recent surgi­cal or aesthetic procedures. Plasma is a non-invasive procedure with minimal level of pain. It is virtu­ally painless, as the treated area is numbed before the treatment. After the treatment the treated area is red (7–14 days) and some patients may expe­rience some swelling, which may last up to 3–4 days. At the site of each spot a small crust will form. They should not be touched and you should wait for 4–5 days for them to fall off naturally. During the procedure the clients may feel some discomfort, not actual pain, depending on the treat­ed area of the face/body. With the help of Plasma instrument it is possible to treat various skin problems (acne), achieve the “lifting effect” of the loose skin or correct or remove scars … If you suffer from any of the above mentioned and do not want to go through a traditional surgical procedure, PRIVÉ Plasma Lifting is right solution for you. 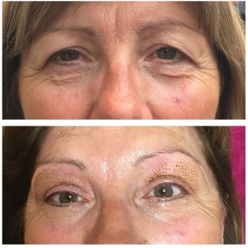 Eyelid lift (upper, lower), facelift, neck lift … Resurfacing of wrinkled areas (labial, nasolabial, worry lines, smile lines …). Removal of different kinds of moles. Scar removal. Are there any possible side effects of the Plasma treatment? The Plasma treatment is an exceptionally safe procedure with virtually no side effects or they occur very rarely. Possible side effects are inflamma­tion, scarring or minor change in skin pigmentation, which is very rare. It is highly important for each client to follow the instructions for after­care closely. Crusts which occur after the treatment are part of the treat­ment and will fall off after 4–5 days. Minor swelling after treating the area around the eyes is normal and will disappear after 3–5 days, depending on the client’s sensitivity..
What aftercare do i need to do? Aftercare is one of the most important parts of the treatment. Each client has to follow the instructions for aftercare closely to achieve the perfect results: Do not pick carbon crust; it will fall off in a few days. Clean the treated area with Octenisept twice a day. After the treatment continue applying the aftercare cream on the treated area as long as it is sensitive or when you are exposed to sun, as it con­tains SPF and protects the treated area. Avoid sauna, pools, solariums or any kind of exposure to activities which present risk for infection of the treated area. Make sure to protect the treated area from direct sun until the skin is completely regenerated (2–3 weeks). Do not apply products containing alcohol or other scents. Until the crusts fall off, you may apply colloidal silver to prevent inflam­mation. Do not cover with plasters. Can I use make-up after the Plasma treatment? The results are visible immediately after the treatment, but we have to in­form the client that the maximum results will be visible after 3–4 weeks when the skin enters the third phase of the healing – collagen and connec­tive tissue growth. So, results are visible immediately, but the end results follow after 3–4 weeks after the treatment. 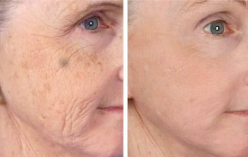 It depends on the state of the clients’ skin and the desired degree of cor­rection. The client is often satisfied after only one treatment, of course if, e.g. the wrinkles are not very deep, but due to the simplicity of the proce­dure and the affordable price the clients opt for two or even three treat­ments to achieve a perfect result. The procedure may be repeated after the skin is fully regenerated, so 6–8 weeks after the procedure. How long will the effect of Plasma treatment last? The results of the Plasma treatment are permanent and may be visible for years. But we should acknowledge that the aging process is continuous and thus the skin ages every day after the procedure and this cannot be stopped. 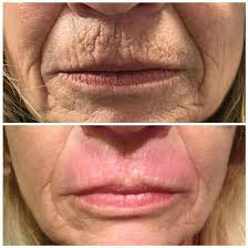 The results of this method are permanent, but when we talk about mimic facial lines (worry lines) these may recur quickly because muscles are stronger than the skin and consequently the lines recur.